BMJ Global Health | BMJ Global Health covers all aspects of global health with particular interest in the underfunded area of non-communicable diseases (NCDs). "BMJ Global Health seeks to address the information problem in global health by being a vibrant discussion forum; an open and inclusive forum that brings together and addresses the broad community of global health stakeholders"
BMJ Global Health is an open access, online journal from BMJ dedicated to publishing high-quality peer-reviewed content relevant to those involved in global health, including policy makers, funders, researchers, clinicians and frontline healthcare workers. BMJ Global Health adheres to the highest possible industry standards concerning publication ethics. To read the journal's detailed guidelines please see our policies. To access the BMJ Global Health blog, click here. Entry to the BMJ Global Health grant is now CLOSED. Applications are being reviewed and the successful applicant will be informed shortly. JUST PUBLISHED: Special collection of papers to celebrate PACK "Empowering frontline providers to deliver universal primary healthcare using the Practical Approach to Care Kit"
WHO recommendations on uterotonics for postpartum haemorrhage prevention: what works, and which one? BMJ Global Health is already contributing to a healthier, more equal world. The Editor-in-Chief’s highlights of the first year of the journal include an intense debate around the reform of the WHO, the publication of important papers regarding the ongoing conflict in Syria and the threat of Boko Haram in Nigeria, as well as articles discussing the management of infectious diseases such as malaria and HIV. BMJ Global Health’s mission for a healthier, more equal world is now enhanced through being indexed in PubMed Central. For more information, or to submit a paper, visit the website: gh.bmj.com. 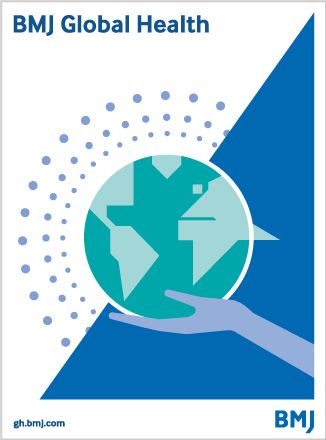 BMJ Global Health accepts submissions of a wide range of article types, including original research, analysis and practice articles, and commentaries. The Author Information section provides specific article requirements to help you turn your work into an article suitable for BMJ Global Health.